Over the last few years, India has witnessed a FinTech revolution. 'Funding for financial technology' or 'FinTech' in short is basically about using technology to improve financial services, and with its ability to touch nearly every aspect of the financial value chain, the scope of this model is enormous. Experts view that these companies can play a significantly positive role in increasing the flow of finances to the micro, small and medium enterprise (MSME) sector. There is not an iota of doubt about it. A recent survey reiterates this view. The FICCI-IBA survey, carried out for the period January to June 2018, has found majority of respondents showering praise on this emerging model. According to them, FinTech companies, with their innovative technologies and business models, enjoy a competitive edge due to their cost-effective operations and fewer regulations than the traditional finance sector. While banks are known for their cautious approach and tougher lending norms, these companies, they view, can make a big difference in lending to MSMEs. If banks and FinTech players come together, the result can naturally be even better. Banks, instead of fighting these companies, can gain from them in terms of last mile reach, more customers, better technology and less operational costs. Positively, some banks -- from both private and public sectors-- have already joined hands with some FinTech companies to reap such benefits. This trend needs to be encouraged further as it can, besides empowering both banks and FinTech companies, make a big difference in helping our cash-starved small businesses. 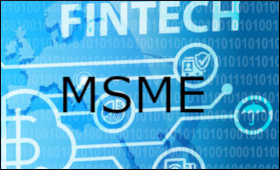 Recently, the Government has formed a Steering Committee to study issues relating to development of the Fintech space in India and its use to enhance financial inclusion of MSMEs. This committee will consider various issues relating to development of Fintech space with a view to make Fintech related regulations more flexible and to boost entrepreneurship. This is a welcome move. A substantial step in this direction will also push some key efforts of the government, including affordable housing, e-services delivery and digital payments. How to get a loan being MSME registered firm. please inform the contact details to get finance for an e commerce start up. READ YOUR ARTICLE ON FINANCING OF SMS'S BY FIN TECH FIRMS. IT APPEARS GOOD IDEA BECAUSE PSU BANKS ARE TIED WITH THEIR CONVENTIONAL AND BUREACRATIC APPROACH. PSU BANKS OR OTHER GOVT BODIES INVOLVED IN SMS'S FUNDING ARE NEVER KEEN TO FUND SMALL TO MEDIUM UNITS BECAUSE THESE PEOPLE DO NOT OFFER SUFFICIENT MORTAGAGE. SO EITHER SMS'S ARE NOT FINANCED OR UNDERFINANCED. FINETECH COMPANIES ARE GOOD ALTERNATIVE DEPENDING ON THEIR APPROACH. EVEN THE WRITER OF THIS MAIL IS LOOKING FOR FUNDING OF ABOUT RS. 10 CRORES. CAN YOU SUGGEST FEW SUCH FIRMS WHO ARE INVOLVED IN SUCH FUNDING ACTIVITY. OUR PROJECT IS IN SUN RISE AND FAST GROWTH LANE.